We are driven by passion and we put all our values in our job. We belive we cannot bring an amazing result without engaging ourself in the research: our goal is the perfect mix to deliver to our customers a product they love to use. Our international team is moved by this purpose and it shares the same values, a professional team at your service! 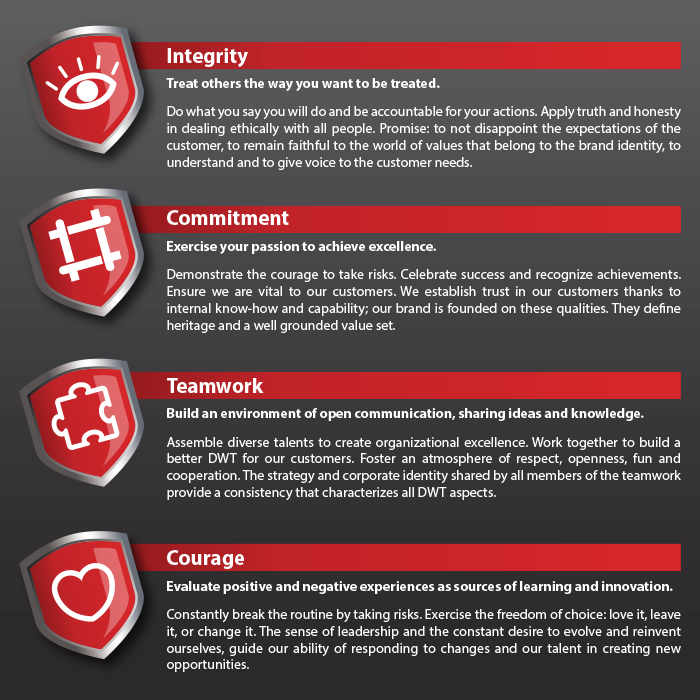 Take a look at our values map! DWT INTERNATIONAL AG is a public corporation with two headquarters located in Switzerland and in China. DWT is a registered trademark and adheres to MERITLINK group. If you would like to learn more about it, please visit the website following the link below. Our primary business function is the production, in our joint ventures and partnership enterprises, of power tools and accessories under the brand name "DWT". All our well-advanced factories fully conform to international standards and allow to produce more than 4 million different power tools and 9.5 million power tool accessories yearly. Today 1500 employees work in our three joint ventures, occupying a total area of 105.000 square metres. Our products are among the most competitive within the international market. Our success has been possible thanks to: a professional and experienced team, the use of modern equipment in our factories, a regulatory compliance of quality control system ISO 9001 2000 and a constant collaboration with other world famous power tool manufacturers for many years. select the correct range of power tools and accessories for a specific market. Our prominent experience on the international market helped us to design a wide range of products, which is renewed every year according to the modern market requirements. Quality, competitive prices, a wide range of spare parts for warranty and after warranty services; all these traits make DWT power tools and accessories competitive against other manufacturers around the world. At DWT, we develop the whole project from the beginning to the end. Our Swiss design team takes care of every single detail in order to provide products who can simplify your daily job. Customer needs: the design process always starts with our customers demands and wishes. Every product always meets our customers needs and it's our priority to make it an easy tool to operate with specific features and with long operating life. Development process from idea to the 3D model: our designers create some initial sketches and ideas for the realisation of the product. This process mainly defined the essential characteristic of the product helping us to coordinate the first stages of work between design and engineering department. In the following steps are analyzed all construction, production and ergonomics aspects in order to arrive to a virtual 3D model on which will be refined the design combining out looking and internal structure. Beyond the product: DWT cares about each aspect beyond the product: spare parts unification in order to reduce the numbers of parts needed to repair the tools, service documentation to ensure a safe and correct use of you tools, packaging design in order to deliver to you the products and its accessories in the optimal way. Markets analysis and brand development: our teams, one located in the heart of "old Europe" and the other in the fast developing Asia are always focused to analyze the markets trends and to turn these input in a successful brand developing strategy and in an effective communication, in order to create a modern and worldwide recognized brand. At DWT, we continue to explore the potential for technological and application-oriented development of electric tools world. We aim to set a new system that can fit the necessities of our reference markets through specific marketing researches, shorter innovation cycles, a client-oriented outlook to deliver the most needed and innovative products. DWT offers a "full line" that covers the entire spectrum of hand-held, semi-stationary and stationary electric tools and it is therefore able to position itself in the market as an overall tools supplier. We are able to offer products to our clients from our coordinated family of products covering all applications, both in the power tools and hardware equipment range. Our declared goal for the coming years is to continue the development of power tools and welding machines range and to start to introduce new categories in order to satisfy all the needs of our clients. At DWT we are convinced that only a motivated and responsible team can ensure success to our company. The aim is to create a completely new "culture of responsibility" by transferring responsibility to specialized departments, and therefore individual employees; each of them carries out his job and ensure the quality of it. We continuously promote the persoonal enrichment organizing specific training to increase the knowledge of the people and reward and recognize the self improvement of our employees.